Stanley Hagenbuch by William Hagenbuch's stone at Trinity Oak Grove Lutheran Church. Reader Alert: As in many posts dealing with genealogy, family lines will be listed. This may be confusing to some people, but it’s important to the understanding of family relationships. This post is about William Hagenbuch’s headstone. William is my great great grandfather. His father was Henry born 1777, his father was Michael born 1746, his father was the immigrant Andreas Hagenbuch born 1711 in Germany. A few months ago, my sister Barb and I traveled north (we both live in the Harrisburg area) to visit our Aunt Ellen and Aunt Mary at Kramm’s Nursing Home in Milton, Pennsylvania. Afterwards we went to the Oak Grove Lutheran Church cemetery to put some flowers at the grave of our parents, Homer and Irene “Faus” Hagenbuch. Visiting the cemetery at Oak Grove is always a pilgrimage for me. Maybe in a future story, I’ll write about the relationship I have with the church I attended as a young man and where many of my relatives attended from its founding date of 1869 into the 1970s. As I walked among the gravestones of our many ancestors buried there, I came across the stone of William Hagenbuch, my great great grandfather, and one of the founders of Oak Grove Church. It laid flat on its face beside the still standing stone of his second wife, Rebecca “Muffley” Hagenbuch. Both stones are identical in size and shape – about 5 feet high, with rounded tops, made of the “salt granite” which wears away over time so they have become difficult to read. Sister Barb walked up beside me and I showed her, in dismay, that the stone had fallen off its base. I was sure it happened not from vandalism but from the broken and rusted metal pins which had held it upright. The stone was too heavy for me to lift upright. As we left, a plan was formulating in my mind. I called Stanley Hagenbuch (my second cousin whose father was Cyrus, his father Percy, his father Hiram, his father William of the fallen stone). Stanley is on the cemetery committee of the church, and he said he might be able to fix the stone. However, I told him I would first find a local grave monument company to provide an estimate to fix it. In the meantime I emailed several of my first, second, and third cousins, asking if they would be interested in donating money to get the stone uprighted. I heard from a few so I made arrangements for the monument company to fix the stone. Timing is everything. Before the monument company could get to Oak Grove to fix it, I received a picture through email from cousin Neil Hess, treasurer of church council (Neil’s wife is Teresa ‘nee Hagenbuch, whose father is Joseph, his father Raymond, his father Joseph, his father William of the stone). 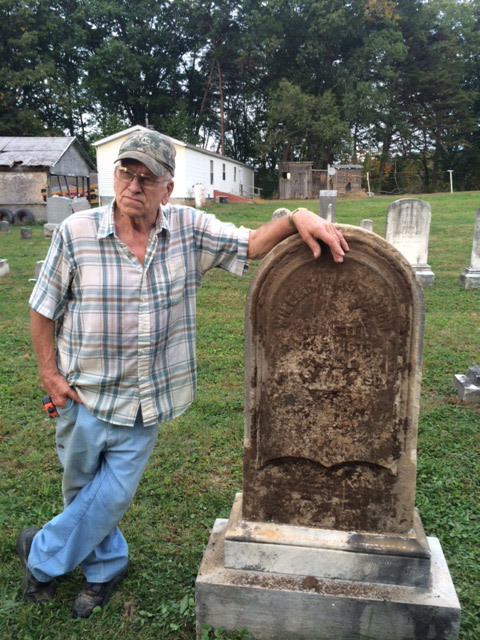 William Hagenbuch’s gravestone stands tall again! The picture showed Stanley standing beside the uprighted stone and Neil had written “William stands tall again.” I immediately called him. He told me that he, Stanley, and two other men went out to the graveyard and fixed the headstone with a skid steer and some metal pipe. And, they fixed about five other stones. I was thrilled, to say the least! The next morning I called the monument company and cancelled their visit to the cemetery. A few days later I received another photo of Stanley beside the stone after he had cleaned off the ground it had laid in during those several months. 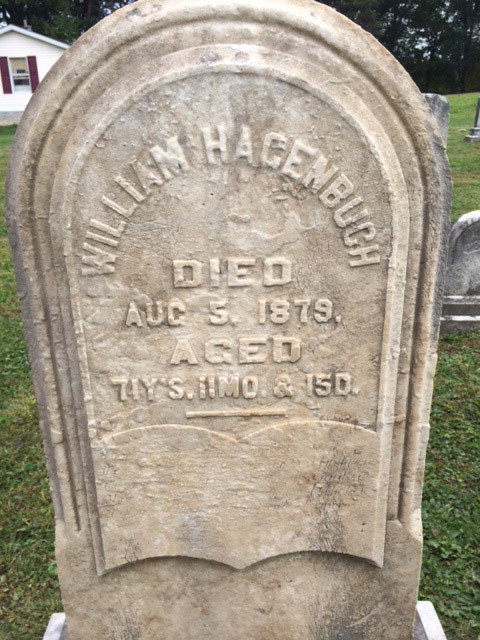 William Hagenbuch’s gravestone after cleaning. And, it’s still standing upright today, thanks to William’s descendants. 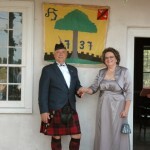 Thank you for another wonderful post about our family! You mention the family farm in Montour County where William died; where exactly is the family farm you mention? Barb….it’s where Bruce, Andrew and Julia lived, down the road from Oak Grove and below Joe’s farm (which was his father’s, Raymond. Before Bruce, Andy, and Julia it was Uncle Is(rael)’s farm, but must have also been owned by his father Hiram after William died in 1879. It would be interesting to find the answer to that question. William moved there in 1853 from the Hidlay Church area after his first wife died and he married Rebecca Muffley (but that’s another tale!). So between 1879 and Uncle Is getting the farm, I’m not sure if Hiram owned it, or not. Hiram owned the farm where the Milton country club now stands but he died in 1897.